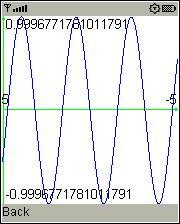 It supports trig and log functions, variables and user defined functions. The Help screen lists all the built in operators and functions and lets you insert a function or operator template into your expression. It also has the ability to plot graphs for user defined functions with one argument. See the author’s site for documentation. The app “Calculator” (56 KB) is ready to download or send to your phone as filename: “Calculator”. is there something apps that can download with android phones,?? Use the Play Store app on your phone to download apps. Can I have it on my phone. If your phone supports Java ME apps and you have data to downlod with, yes. Can we download this app?